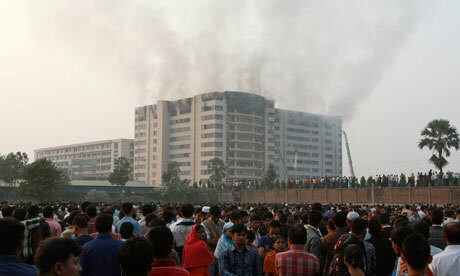 We are stricken by the news out of the Bangladesh today, where at least 28 garment workers have died in a factory fire. As you know, we have been campaigning for these workers, with your support. Our campaign is ongoing, and we will keep you posted on how to get involved as the story develops. In the meantime, please read the below message from the Clean Clothes Campaign. Labour rights groups: “Failure of brands, government and manufacturers to take preventive action condemns more workers to die”. At least 28 more Bangladeshi garment workers have died and dozens more have been injured after a fire broke out today on the 9th and 10th floors of the “That’s It Sportswear Ltd” factory located 16 miles from the capital Dhaka. Several workers appeared to have suffocated, while others jumped to their deaths trying to escape the burning building or were trampled by their colleagues as they rushed towards the exits. The factory was reportedly producing for major international buyers including Gap (confirmed) and Wrangler (VF Corporation), as well as for Hong Kong buying house BF Fashion. It belongs to the well-known Ha-meem group, one of the biggest manufacturers in the country, which has a dubious labour rights track record. The company is known for unauthorized subcontracting, meaning the factory may have also been producing for brands which are unaware of their production there. The Clean Clothes Campaign (CCC) and other labour rights organisations have regularly contacted buyers sourcing from Ha-meem about violations of freedom of association and other labour standards at the company’s factories. According to the Ha-meem Group website their buyers are presently Walmart, H&M, Next, JC Penney, Kohl’s, Squeeze, Sears, Target Store, Charming Shoppes, Carrefour, Inditex, Miss Etam, Migros and Celio. Following the deaths of 21 workers in the “Garib and Garib” factory in February of this year, virtually all of the buyers of Hameem group were contacted by the CCC, the International Labour Rights Forum (ILRF), the Worker Rights Consortium (WRC), and the Maquila Solidarity Network (MSN) with a set of recommendations* outlining specific measures that should be taken to eliminate the systemic problems underlying these deadly tragedies. “More needs to be done by all concerned to ensure further disasters are prevented” the buyers were told, but brands, employers and the government failed to take the necessary action to avoid these preventable tragedies. Measures proposed by the labour groups included a thorough review of all multi-story garment production facilities, expert fire safety inspections and ensuring that workers are allowed to report and challenge health and safety violations by supporting their right to organize. “Workers keep dying while the brands, the government and the employers drag their feet and try to shift the responsibility upon each other” says Ineke Zeldenrust from the CCC. “We’ve warned the brands repeatedly that this would keep happening again and again, but they’ve chosen to respond only in a minimal fashion,” she added. The CCC, ILRF, WRC and MSN also call upon the brands sourcing from the Hameem group to make sure that the injured receive all the medical care needed and that they and the relatives of the victims are compensated for current and future loss of income. Bangladeshi garment workers fight for their rights, will you? This entry was posted in CSR, fashion, Fast Fashion, Health and Safety, HIDDEN NARRATIVES, Human Rights, Labour, Political, REPORTS, Responsibility, Social, Social, Social Conditions, Social Responsibility, Supply Chain, The Clean Clothes Campaign, Torture, Transparency and tagged Bangladesh, BF Fashion, Carrefour, Celio, Charming Shoppes, Clean Clothes Campaign, death, Dhaka, fire, Gap Inc., Garib and Garib, H&M, Inditex, International Labour Rights Forum, JC Penny, Kohl's, Maquila Solidarity Network, Maquila Solidatity Network, Migros, Miss Etam, Next, Sears, Squeeze, Target Store, Walmart, Workers Rights Consortium, Wrangler on December 14, 2010 by Mary Hanlon.